Because of its extensive trail systems and its close proximity to Yellowstone National Park, West Yellowstone is affectionately called the snowmobile capital of the world. For nearly 45 years, we have introduced dozens of thousands of guests into Yellowstone's winter wonderland atop snowmobile. Click to see our packages, rates & sled types. Enjoy Ski-Doo® sleds certified for Yellowstone use, or power sleds for nearby forest and backcountry trails & bowls. Great rates on complete lodging/rental packages too. 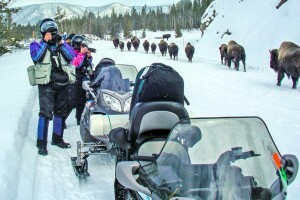 Offering a great selection of Polaris one and two-person sleds for inside Yellowstone tours and backcountry adventure. Featuring RMK 600 and 800. Our location near Gardiner MT puts your snowmobile group in the ideal location to access the Tom Miner Basin, and prime National Forest areas. Offering 11 bedrooms & 5 baths. Great quality, reasonable rates, and is family and pet friendly. Offering single- and multi-day sled rental and lodging packages. Expanded Cont. Breakfast with hot protein. From West Yellowstone, you can enjoy hundreds of miles of groomed snowmobile trails in a three state region – Montana, Idaho, and Wyoming. This is the starting point to enjoy a winter wonderland of unparalleled beauty. Two Top Trail is a popular choice for its variety of terrain and 2,000 foot elevation gain. The trail is groomed, and powder fields abound. From the upper areas, the surrounding mountain ranges come into view, including the Wyoming's Tetons, Idaho's Centennial Mountains, Lionshead in Montana, and Yellowstone National Park. Bring a camera to take advantage of the photo opportunities! The Big Sky Trail provides some of the best backcountry snowmobiling in Montana. This 110-mile trail begins just north of West Yellowstone. The first portion is groomed, but the trail quickly turns into an ungroomed powder experience. Deep fields of snow, and outstanding hill climbing opportunities are the hallmark of this well-known and challenging trail. Lionshead Trail offers an exciting experience for those seeking something more radical. Following the east side of the Continental Divide, the trail climbs to over 10,000 feet. Lionshead is short (10 miles), but sweet, with plenty of the steep terrain, very deep snow, and outstanding views. Horse Butte Loop travels the shores of Hebgen Lake. This trail makes a pleasant excursion through thick pines and open meadows and along the lake. South Plateau Trail heads south for 13 miles and provides great views of the area's mountains, following creeks and rivers away from the crowds. The Continental Divide Trail offers a unique snow travel experience, connecting central Wyoming with our communitiy via Yellowstone National Park. The trail system begins near Lander, Wyoming at Sinks Canyon, and winds through the Wind River Mountains near Pinedale and Dubois. The trail then passes through Togwotee Pass and Moran before entering Grand Teton National Park in Jackson Hole, Wyoming. The trail follows the Rockefeller Parkway and ends at Yellowstones southern entrance. With so much snow, trail variety, and spectacular scenery, it is no wonder our destination consistently earns top reviews. West Yellowstone is truly the "Snowmobiling Capital of the World." National Forest tours typically range between $200-$250/person. Snowmobile rentals typically range between $100-$200, depending on the model. 200 miles of trails are currently available within Yellowstone National Park itself, along the same roads traveled by tourists in the summer time. The riding is controlled, offering less freedom than the terrain outside the park, but seeing the park's many features in their "winter attire" is a unique experience. 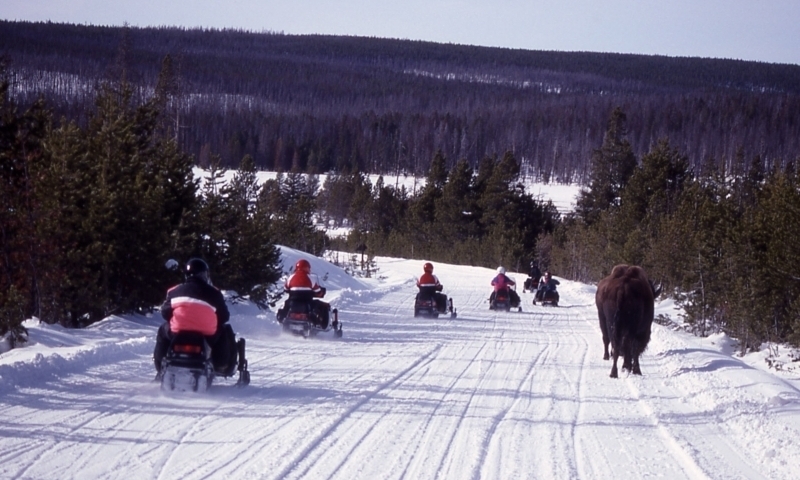 You must be with a guided group to enter the park on a snowmobile. 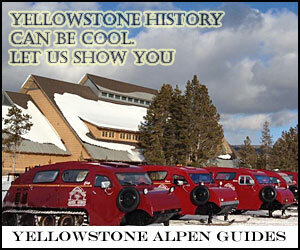 Yellowstone National Park tours typically range between $250-$350/person. Island Park offers incredible, crowd-free riding and huge amounts of snow, adding to the amazing network of possibilities with another 500 miles of groomed trails! Talk about powder - Island Park receives over 250 inches of light, fluffy snow a year! West Yellowstones trail system is connected to those in Island Park, making it easy for visitors in either community to enjoy both areas. Colorado snowmobile vacations start at AllSummitCounty.com! The Montana Nightriders Snowmobile Club is a local club for snowmobile enthusiasts in western Montana, which plans annual snowmobiling events and provides info on local weather and groomed trails. A local Jackson club, the Snow Devils plan a number of events and rides in the area, including the famous Snow King Championship Hill Climb. Learn how to use snowmobiles responsibly in the backcountry.